So I'm a day off. I thought today was Sept. 1st! Yesterday was the day to post projects for Le Petite. Oops. I'm clearly still on vacation time. August's project was Honeycomb Schnibbles by Carrie Nelson for Miss Rosie's Quilt Co. I have loved this pattern and wanted to make it as soon as it came out. I took a chance and started piecing it before it was picked for the August project and finished it while on vacation. I lucked out. There is something very therapeutic about piecing. Now that I am quilting for others, which I love, but I have found I take almost no time to work on my own stuff. The last few months I've tried to take a few moments (literally moments) here and there to work on my own things. It's working! I've been able to piece a few things. It's amazing how just a few moments here and there adds up! This has to be one of my most favorite Schnibbles yet! I love how it turned out! This reminded me so much of English Paper Piecing that I decided I really wanted to use reproduction fabric. I used a couple of charm square packs from the new Collections for a Cause fabric line called Comfort. This is some seriously beautiful reproduction fabric!! 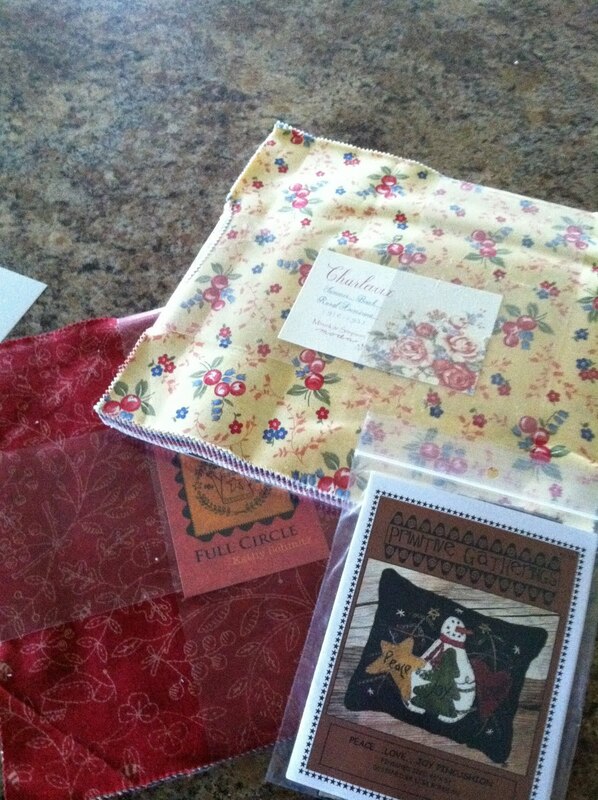 It's taken all the willpower I have to NOT buy one of the FQ bundles of this we have at the shop! I used my go-to background fabric...Primitive Muslins. Pretty sure I need to buy a bolt of it!! This is an awesome pattern. Any fabric line would look gorgeous done up in it. It's a really great pattern that showcases the fabric. I know there were fellow Le Petite members that didn't enjoy making this one. At first, I was a little concerned with all the angles and worried it would look wonky, but I followed Carrie's awesome directions and no troubles. I would heavily recommend that you prepare your fabrics first for this pattern. Meaning either use Magic Spray Sizing or Niagra's non-aerosol starch before you start cutting the pieces. It will help you immensely. Preparing the fabrics will add body to the fabric, so cutting all those triangles and trapezoids will be a breeze. Make sure you stop by Sinta's and Sherri's blogs to see the parades of all the different Honeycombs. Every month there are a few quilts in the parade picked for winners of various prizes. I've been lucky enough to win before, but last month I won...we all won. I won a gift certificate to Quilt Taffy AND everyone that participated in the parade won! Carrie Nelson and Miss Rosie sent each of us a very generous prize of two layer cakes and a pincushion kit from Primitive Gatherings. Ok, so if you don't already know...Carrie Nelson and Miss Rosie ROCK!!! 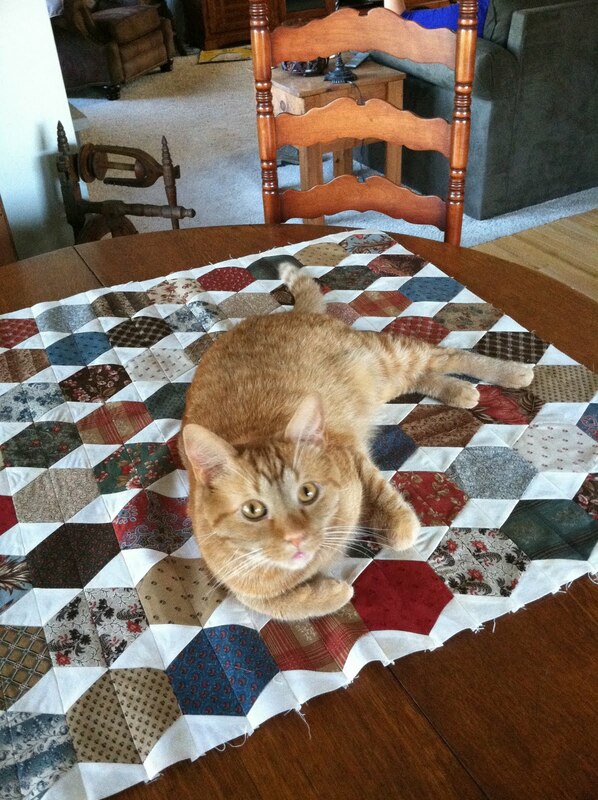 :-) A big BIG thank you to Quilt Taffy, Carrie Nelson and of course Miss Rosie. Hope everyone has a great long weekend. I've been wondering if you were finding time to sew for yourself since you started quilting for others. It must just take time to find that balance. I have a local friend who quilts for others and she is also very productive with her own work. She's had her quilting business for quite a few years though. At least 7 because that is as long as I've known her. Oooo, those fabrics look beautiful too. I wish my LSQ carried them so I could look and feel them. I like the simplicity of this pattern, it really shows off the fabric. Love the homespun-ness of your fabrics. I think Scooter is asking for his own quilt...or maybe he just wants to test "drive" them all. Love that Schnibbles pattern! Must make one for me! Congratulations on your finished quilt top AND on winning a gift certificate to Quilt Taffy! Love those fabrics! With less pieces, the Honeycomb quilt with make a nice doll size quilt. Love the fabrics you chose for your Honeycomb. It gives it a completely different feel. Great fabric choice on that one...I love it! It seems as though Scooter does too! have a great weekend!! Oh I love this , I bought a schnibbles book because I have fallen in love with the quilts I have seen on different blogs . This one is stunning , you choose fabulous fabrics! Scooter has good taste - it's lovely! I love your honeycomb quilt and in the reproductions! It's really a sweet pattern. Love the quilt as much as Scooter! Glad you are taking time to quilt for yourself. Oh it is sooo cute! How lovely - and congrats on your win! I love the look of this done in reproduction fabrics, they seem to "fit" together so well. Great looking quilt. Good choice of fabrics! Yes, they do rock, and that is so fantastic that they sent you guys all that stuff. Wow! I'll go in on that bold of primitive muslin with you if you want. Can't tell you how many times I wished I had some! LOL. Miss ya. It really was a fun and challenging pattern wasn't it. Yours looks great! Pretty, pretty - and yes, Scooter, you're pretty, too! I see why you love those fabrics, Linda! I enlarged the picture of your quilt. You did an amazing job of pieceing the geometric prints!! Good post - sorry I havnt visited in a while - its good to know what you are up to. Life sounds so busy :)How are the girls? Miss Rosie patterns are the best, and I love how this one turned out. I want to sew everything you show! I agree that this is one of my favorite Schnibbles too. And a big orange cat on top makes me love it all the more. :-) Great picture.